While attempting to use an aftermarket switch and fog lights with the OEM wiring harness, I couldn't get the switch illumination to work properly. The next day, as it was getting dark I noticed that none of the interior lights worked. Radio and dome still function properly, tail/brake lights are on, and the gauges/odometer/clock/thermometer still worked, though. Noticed fuse #12 was blown, and replaced it. Blows as soon as the key is turned on. Just replaced the headlight switch, and lights still don't work. I'm going to flip the parking lights around once the weather is decent again. Is it at all possible that I shorted something while trying to get the switch lights to work? I'm at a complete loss, and used an aftermarket/separate harness for the fogs instead of the OEM wiring after I noticed the issue. Last edited by BaselessEarth12; 04-17-2019 at 04:59 PM. Clock, combination meter, illumination light, body integrated module, headlight lever switch, and HID relay. Since the fuse blows out instantly, it means there is a short somewhere. Since the trouble seems to have started with the fog light mod I suggest you disconnect the switch that was added and then see what happens. If the short is eliminated then you need to check the wiring to the switch. If that doesn't help you are going to have to eliminate the circuits that are powered through that fuse. To help find the trouble you could use an ohmmeter to monitor the protected side of the fuse and watch the meter reading as you disconnect suspected circuits for the trouble. When the fault is disconnected you will see a pretty significant increase in the meter reading, indicating a normal load resistance, rather than a short to ground which will have a very low resistance reading dependent mainly on wire losses. Since the trouble seems to have started with the fog light mod I suggest you disconnect the switch that was added and then see what happens.. The harness that I'm currently using for the fogs is completely separate from the illumination circuit... When looking at the wires in the steering column and under the dash, everything looked fine. There's a noticeable clicking sound that comes from the passenger-side dash that I'm pretty sure didn't happen before. Any thoughts on that? In your first post you stated that you couldn't get the switch illumination to work properly. If you are talking about the light inside the switch itself then I suggest you disconnect the connection to it. See if the short clears then. Hopefully you didn't tie one side of the switch directly to ground as the return for the switch lighting needs to pass through the illumination control module. The return for the lights is provided by the module. The clicking sound could be circuit breaker cycling due to a short on the line. The light in the switch works fine. It's the dash, HVAC, window/lock control, and shifter lights that don't. Which is made all the more confusing by the thermometer, odometer, and clock illumination still working, as well as the taillights. The gauges function properly, as do all the other controls, but not the illumination lights. Glove box light doesn't work, either. It seems you have more than one problem going on here. I assume that fuse 12 still blows out instantly. One of the places that fuse supplies power to is the body integrated module. I suggest you disconnect that module and see if the short on fuse 12 goes away. Where is that module located? 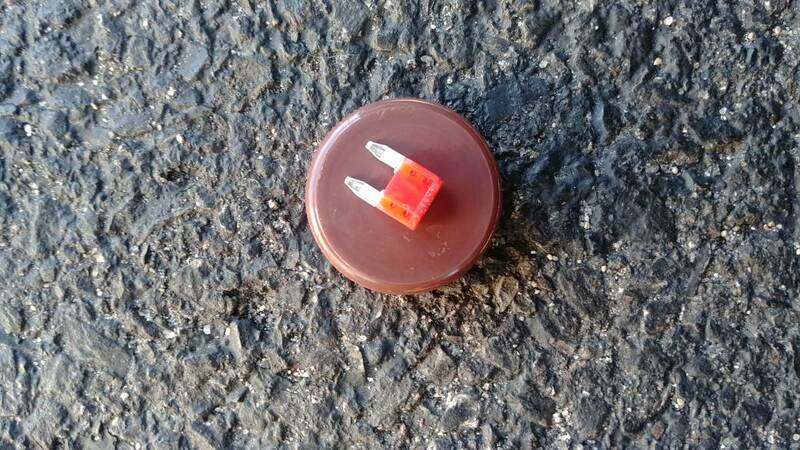 Would any fuse below 10A work to test? The module should be on the right side of the steering column, under the dash. Look for two colored plugs going to it, blue and gray. The circuit is designed to provide current something under 10 amps, so that should be what is used to replace it with. We are trying to find a shorting problem. If you use a lower current fuse we could eliminate the problem and the fuse still might blow out due to the improper size. Perhaps the current draw is normally around 8.5 amps, a 8 amp fuse would still blow out and we wouldn't know for sure if the problem was eliminated or not. If you have an ohmmeter you can check the resistance on the protected side of the fuse position. Place one probe there and the other on a known good ground point. You may not even need to turn on the ignition to make this check, though resistance readings are always taken without power being applied. Turning on the ignition could activate some relay that is in the circuit that switches power to a circuit that has the short on it, so check the readings both ways of the ignition. With the short happening the meter resistance reading should be less than 3 ohms. When you disconnect the module and see a significant rise in the meter reading then you have eliminated the short. If you don't see much change then you need to look at other areas for the problem. Last edited by Cougar4; 04-17-2019 at 09:53 AM. Alright. Looks like I'm grabbing another box of fuses and a multimeter after work today. I'll report back with the results. As a side note, I turned my side marker lights around, and neither side comes on... All other parking lights and license plate light work, however. Do the side lights work using the bypass switch on top of the column? No. Before I put the Sylvania LED's in, only the passenger side was working, anyway. Apparently, the LED bulbs are polar, whereas the halogens appear to not be. LEDs are indeed polarity sensitive, they are diodes. I think it might be best to fix the shorting issue first and then look into the other problems afterwards. Diodes (either passive device or LED) ARE polar! Incandescent or halogen bulbs are NOT polar! Coils (vent valves, fuel valves, evap valves, ignition coils, etc.) are NOT polar! BTW, LED's are "light emitting diodes", thus the polar bit, so ya know. I knew about LED's themselves being polar. Just thought the bulbs would have some way of indicating which was which, or that allowed them to be plugged in in either orientation... I was mistaken, though! Last edited by BaselessEarth12; 04-17-2019 at 03:21 PM. Regardless of whether or not BIM/BIU is connected, the fuse basically explodes the moment the lights are turned on. Kindof hard to see in the pic, but you can DEFINITELY tell it's blown visually... There was a rather large spark inside of it, too. Any other thoughts as to where the issue may be? Everything that I added for the fog lights has been removed entirely: relay, switch, fog light pods. Thinking about it now, a friend of mine said that it may be a short somewhere in the harness. Looking elsewhere for a possible marker light fix, I saw that it could be a relay gone bad... Could that be the issue for the interior lights, too? So removing the module didn't clear the short. The hunt continues. If you have a ohmmeter what is the resistance to ground at the protected side of the fuse? I assume it near zero ohms. If that is the case, start disconnecting suspected circuits at connectors and try to get the resistance reading to go higher, at least around 5 ohms. The trouble will be on that disconnected connector. Resistance before short was between 0.7 and 0.3Ω. Last edited by BaselessEarth12; 04-18-2019 at 07:11 AM. I presume that the trouble occurred after the mod was done so, anything related to that work would be a good logical place to start the hunt for the trouble. The wire color from the fuse to the various loads is violet. The short will be on that wire. Is violet a ground for the gauges, too? The violet wire from fuse 12 provides power to various lighting circuits, like lights inside the cluster that you stated aren't working. I assume you are leaving the meter connected to the fuse contact to make the checks. When the short is removed from the circuit the meter reading will go up. The violet wire does change colors after going through certain connectors, like to the dash area. The return wire for the dash lights at least is an orn/wht wire that goes to the body module and then to ground. We don't need to be concerned about that side of the circuit as the short is on the power side of the circuit. After unplugging everything downstream of fuse 12, and between the gauges, I couldn't find a short... Yes, I was keeping the contact on fuse 12 the whole time. All I found was 6 cents in the center console. Well good find on the cash, don't spend it all in one place. You are going to have to keep looking for the problem. In post #2 I stated the areas that fuse ties to. I will try to look up the connectors that fuse ties to.